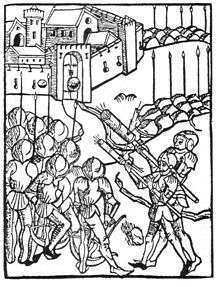 The etymology of the French word pistolet is disputed. It may be from a Czech word for early hand cannons, píšťala "whistle", or alternatively from Italian pistolese, after Pistoia, a city renowned for Renaissance-era gunsmithing, where hand-held guns (designed to be fired from horseback) were first produced in the 1540s. Other suggestions include from Middle High German pischulle or from Middle French pistole. Also it is suggested that early pistols were carried by cavalry in holsters hung from the pommel (or pistallo in medieval French) of a horse's saddle. The most common types of pistol are the single shot, and semi-automatic. Single shot handguns were mainly seen during the era of flintlock and musket weaponry where the pistol was loaded with a lead ball and fired by a flint striker, and then later a percussion cap. However, as technology improved, so did the single shot pistol. New operating mechanisms were created, and due to this, they are still made today. It is the oldest type of pistol, and is often used to hunt wild game. Multi-barreled pistols were common during the same time as single shot pistols. As designers looked for ways to increase fire rates, multiple barrels were added to all guns including pistols. One example of a multi-barreled pistol is the Duck's foot pistol, which generally had either four or eight barrels, although some 20th century models had three barrels. 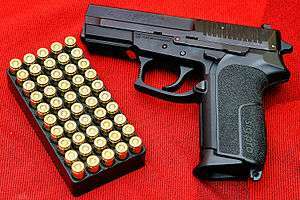 The semi-automatic pistol was the next step in the development of the pistol. By avoiding multiple chambers—which need to be individually reloaded—semi-automatic pistols delivered faster rates of fire and required only a few seconds to reload (depending on the skill of the shooter). In blowback-type semi-automatics, the recoil force is used to push the slide back and eject the shell (if any) so that the magazine spring can push another round up; then as the slide returns, it chambers the round. 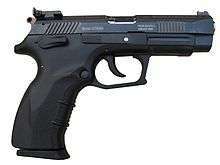 An example of a modern blow back action semi-automatic pistol is the HK VP70. The Liberator is a physible, 3D-printable single shot handgun, the first such printable firearm design made widely available online. The open source firm Defense Distributed designed the gun and released the plans on the Internet on 6 May 2013. The plans were downloaded over 100,000 times in the two days before the US Department of State demanded Defense Distributed retract the plans. ↑ "Pistol – Definition". Free Merriam-Webster Dictionary. Retrieved 19 January 2015. ↑ "British Dictionary definitions for pistol". Dictionary.com. Retrieved 19 January 2015. 1 2 "Revolver – Definition". Free Merriam-Webster Dictionary. Retrieved 19 January 2015. 1 2 "Revolver – Define Revolver". Dictionary.com. Retrieved 19 January 2015. ↑ Skennerton, Ian D., Small Arms Identification Series No. 9: .455 Pistol, Revolver No. 1 Mk VI, p. 10, Arms & Militaria Press, 1997. ↑ "pistol, n.". OED Online. December 2014. Oxford University Press. http://www.oed.com/view/Entry/144645?rskey=BtMENp&result=1 (accessed 21 January 2015). ↑ "revolver, n.". OED Online. December 2014. Oxford University Press. http://www.oed.com/view/Entry/164985 (accessed 21 January 2015). ↑ "revolver: definition of revolver". Oxford Dictionaries. Retrieved 19 January 2015. ↑ Newton, Mike (15 April 2012). Writing Westerns: How to Craft Novels that Evoke the Spirit of the West. F+W Media, Inc.
↑ Shideler, Dan (24 September 2009). "Jeepers Creepers, Where'd You Get That Pieper?". GunDigest. Retrieved 19 January 2015. ↑ "US government orders removal of Defcad 3D-gun designs". BBC News. Retrieved 13 May 2013. ↑ Biggs, John. "What You Need To Know About The Liberator 3D-Printed Pistol". TechCrunch. Retrieved 13 May 2013. ↑ Hutchinson, Lee. "The first entirely 3D-printed handgun is here". Ars Technica. Retrieved 13 May 2013. ↑ Greenberg, Andy. "3D-Printed Gun's Blueprints Downloaded 100,000 Times In Two Days (With Some Help From Kim Dotcom)". Forbes. Retrieved 13 May 2013.